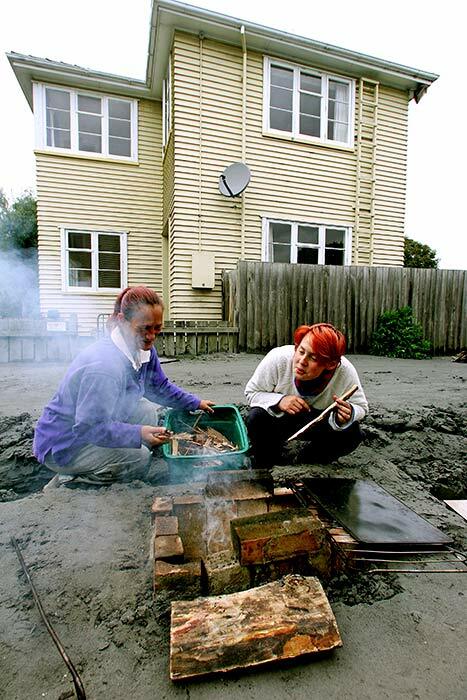 Two residents of the Christchurch suburb of Shirley, Gaye and Phillipa Stevens, try to boil water in their driveway on 26 February 2011, four days after the major earthquake. Thick liquefaction can be seen on the ground. Many Christchurch residents, especially in eastern suburbs like Sumner, went for many days without power and water, and became dependent on water deliveries, neighbourly assistance and their own ingenuity to make do.